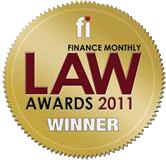 After much hard work and many hours spent number crunching, Finance Monthly is proud to officially inform you that you have won a Finance Monthly Law Award 2011. Please accept our warmest congratulations. The role of corporate lawyers cannot be underestimated, they have been at the very heart of the global recovery and their day to day involvement is vital to ensure stability, consolidation and growth. The past year has seen the green shoots of recovery begin to blossom and although the difficult business environment is ever present, law firms continue to flourish. In difficult trading conditions such as these the successful firms innovate and stay fleet of foot to meet the changing business climate head on. The 2011 Finance Monthly law awards recognises all those firms that have dedicated their resources to innovation, built on their depth of expertise and performed outstandingly over the year. This year we expanded the number of jurisdictions and indeed categories so that we accurately reflect the ever changing legal landscape. Our voting process began some ten weeks ago with the announcement that that votes were now being accepted (via http://www.finance-monthly.com/awards.asp). Our voting notification email was sent to our large proportion of readership database – over 36,000 contacts were emailed. In total we received 4215 votes (11.71% response rate). We were delighted with this high response rate and thank all those that took the time to vote (typical response rate for comparative awards are 5-8%).